The iconic film “Casablanca” was released in 1943, when Paris was in its third of four and one-half years of Nazi occupation. 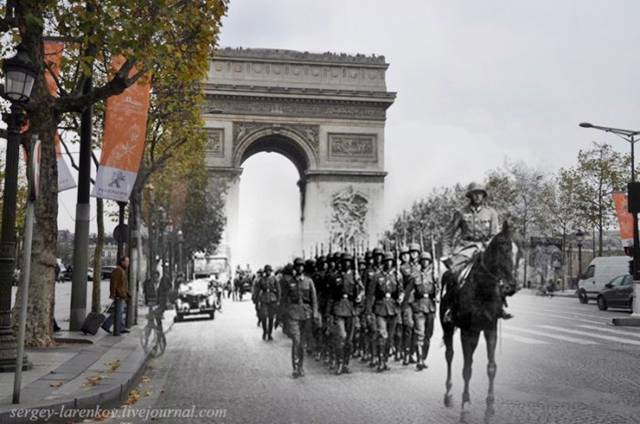 Every day at noon, German troops paraded through the Arc de Triomphe in order to rub French noses in the merde of defeat. But what did Bogey’s character mean? Clearly, they did not actually have Paris, either in reality or in the story. 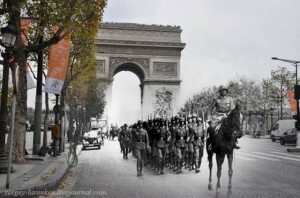 He meant that they would always have the memory of their time together in Paris. Yes, memories are precious. To a great extent, memories are who we are. That is why Alzheimer’s is so tragic. Nevertheless, we do not want memories to be all we have left. We actually want to hold onto the people and places we love. But merely wanting something is not enough. We must do what is necessary to hang onto the persons and places we treasure. Otherwise we are sure to lose them, leaving us only with memories – including the memory of our dismal failure to preserve what we valued so highly. What is more, we need to provide the wherewithal to protect what we value. We valued our ambassador and the other three Americans at our consulate in Benghazi. But because President Obama had removed the Sixth Fleet from the Mediterranean, we lacked the ability to rescue them, and they were killed. The first requirement is motivation; the second is ability. I wonder whether we still have either one. But I especially wonder whether we have the motivation. The cause of the terribly destructive fire at the Cathedral of Notre Dame de Paris is still uncertain. In view of the many attacks on churches in France and elsewhere in Europe, the possibility of terrorism must be considered. There have been almost 2000 attacks on French churches in the past two years. But in view of the marked reluctance of the governments of France and other nations even to use the word “terrorism,” we have a right to ask whether the possibility of terrorism will in fact be seriously considered – and moreover, whether the results of the investigation will be made public. Even the so-called conservative Fox News bends over backwards to be politically correct. When French commentator Philippe Karsenty mentioned that the fire might not be an accident, he was rudely shut off by anchor Shepard Smith. Karsenty is hardly a bomb-thrower (pun intended). If even a rational, well-spoken person is blocked before merely suggesting the possibility of terrorism, we know there is something wrong. But even if terrorism were ruled out, questions remain: Notre Dame is an iconic landmark of the French capital. It is a religious and artistic treasure dating back half a millennium. Renovation of old buildings is a notorious source of fires. Why was greater care not taken? Why were adequate numbers of fire extinguishers not placed at key locations? Why were trained fire-suppression workers not on site 24/7? Why was a fire engine and its company not on duty at all times? In view of the horrendous traffic in central Paris, the response time of the fire department would be expected to be long – which it in fact was. Perhaps there is a clue in the name of the cathedral, which is “The Cathedral of Our Lady of Paris.” The builders of the cathedral worked with loving care, knowing that the building would not be completed in their lifetimes. They knew they were working to produce a jewel that would remain for many centuries as a reminder of God’s glory. They knew the building would have no practical value, but it would have incalculable spiritual value. It would be a symbol of France itself. The French people can rebuild Notre Dame Cathedral. The techniques of the Middle Ages may no longer be known, but modern techniques can restore the structure of the building. But can we restore the faith that produced the building? Faith in God? Faith in the Judeo-Christian civilization that our ancestors struggled to preserve and hand on to us? Faith in ourselves? Faith that, like other peoples, we deserve to have our own nations, with our own languages, our own traditions, and our own religions? Once it is lost, faith is much harder to restore than even the most beautiful of buildings. Will we always have Paris? Will we always have Western civilization? If we mean merely treasured memories, the answer is yes. But if we mean actually have them, the answer is: I don’t know. Right now things don’t look promising. But there is still time, if we get our act together.